After listening to Feherty’s interview with Dave Stockton this week I was intrigued by how little one of the greatest putters of our era had to say about putting. Well what I actually mean is how little he had to say about the mechanics or techniques of putting. So I decided to fill in the blanks by reading his 2011 signature offering on the subject called “Unconscious Putting”. In an act of full disclosure, even though I am a self-confessed obsessive golfer I read very little instructional material on the subject. My extensive golf library has maybe 8 books that involve golf instruction and none of them were published after 1975. I gave up my subscription to Golf Digest about 20 years ago because the magazine was all resort ads or those one page instructional caricatures with doozies like “for proper posture on a bunker shot imagine you are standing on the sidewalk and someone is dropping a sack of potatoes to you from the first floor fire escape of a Brooklyn tenement building…….”. My standard response to someone who asks me for swing advice on the course or the range is, “it is an act of lunacy to accept swing advice from anyone you are not paying to give it to you” . Which is probably why I found Stockton’s book so intriguing. There are only a handful of putting drills mentioned in the book. In 90 pages of text there are almost no professed must-do putting mechanics that are emphasized. He provides no metrics for swing length, swing path, or cadence of a stroke. The closest he gets to putting minutiae is waffling on whether it is acceptable to leave a putt 16 or 18 inches past the hole. If you are the type who is only satisfied when every box on the New York Times Crossword Puzzle is filled in this book is probably not for you. 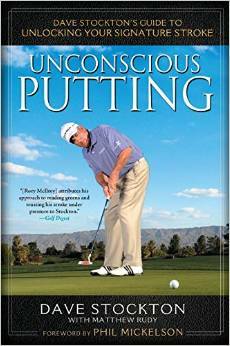 His core assertion is ”Unconscious Putting involves learning how to accurately see the optimum line that a putt should take to the hole and giving yourself a consistent pre-putt routine that lets you preserve that visualization and roll the ball on your intended line”. This should be the focus of all your practice time and pre-round preparation. That is pretty much it though he does provide eight chapters to emphasize and support this thesis. He suggests that about 50% of your practice time should be on building a sound repeatable pre-shot process for ascertaining the proper line for a putt. The rest of it should be spent building a confident stroke that can roll your ball on the intended line. There is plenty in the book on learning to read greens properly, refining your pre-shot routine to make it efficient and serve the Unconscious Putting axiom, and managing your emotions so that your putting can be productive and fun. As to putting mechanics he has no preferences or biases. It is only a 36 to 48 inch swing from end to end so how much mechanics can be involved in it. He feels that If you can deliver the club face to square of the intended line and two inches past it you can pretty much do it with any grip, swing path, swing length, cadence, or putter, for that matter, that works for you. Trusting your inner putting zen is very important to Unconscious Putting. He is not in favor of spending hours on the putting green hitting the same length putt over and over. He says, “you should never practice with more than two balls at a time and you need to change up the length and break of the putts after every sequence of two putts”. Stockton says that of all of the instruction he has ever gotten on putting “90% of it has been on the mental side-maintaining my routine, staying positive, believing I would make every putt, and not blaming myself when the ball didn’t go into the hole”. On this last point he gives the example of Nicklaus who he says believes he never missed a putt when the tournament was on the line. Truth is he missed his share but to his credit he never carried the misses with him after the fact. His miss amnesia ability was instrumental to his putting success in major events. I heard a teaching pro recently say to his student during a putting lesson, pick your line, put a good stroke on it on the intended line, and if it doesn’t go in blame the green superintendent. This is a book well worth reading even if you do not buy fully his emphasis on feel over putting mechanics and result analysis. Stockton has helped some of the greatest players in the game, Mickelson, Sorenstam, Tiger, and Rory, rediscover their putting Id through the philosophy fleshed out in this book. It has to help your golf game to read what Stockton has to say about unlocking “your signature stroke” and then step back and give it some air on the putting green. If you have watched any golf TV broadcast in the last year in a conscious state then you know the PGA Tour has wrapped it’s arms around a new statistic for putting performance called Strokes Gained Putting. It has become the overnight standard for determining who is putting the best in any given Tour event. The genius behind this concept is Mark Broadie professor and research maven at Columbia University and a single digit handicapper to boot. His background is in statistical analysis of financial performance dealing with unintelligible things like pricing of derivative securities, risk management, and qualitative decision-making under uncertainty. Sounds to me like a man who can get to the bottom of your putting woes. 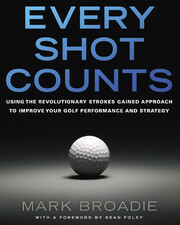 Mark Broadie’s recent book “Every Shot Counts” is the professor’s exhaustive explanation of the Shots Gained statistical approach to performance in all aspects of the game of golf. With the help of the PGA Tour’s commitment since 2004 to collect exacting data on every shot and putt at PGA Tour events through their Shotlink system, Broadie has found the ocean of data to develop his theories and articulate how to explain much of what we see week-to-week on the tour. He starts from an obvious premise that the benchmark statistics that have been used for years to measure golf performance, Fairways Hit, Greens In Regulation, Scrambling, Putts Per Round, and Putts Per Green In Regulation are too shallow to give any meaningful direction to the players on how to improve their performance vis-à-vis their peers. From the stats he gleaned that PGA pros average 29 putts a round with an average score of 71. Tournament winners average 67.4 strokes per round so the differential between winning and the average is 3.7 strokes per round. Pertinent question is what part of their game contributes to the 3.7 strokes per round advantage of the winner over the field, their shots gained on the field. With the help of the Shotlink data available to him Broadie sketched out how strokes gained putting could prove a more accurate measure of putting performance for the professionals. The average strokes gained putting for all golfers in a PGA event gives the ponderous among us a simple and reliable measure of the players relative putting proficiency that week. If Luke Donald is 15 feet from the hole and makes the putt and the average number of putts a pro takes from 15 feet is 1.78 then Luke has .78 strokes gained putting for that effort. If Vijay is five feet from the hole, where the average pro takes 1.23 strokes to hole out, and two-putts then he has a -.23 strokes gained putting on this hole. The sum of the strokes gained putting for the 18 holes based on their first putt is the player’s strokes gained putting for the round. Below is a Broadie chart that shows the top 50 putters on the PGA Tour from 2004 to 2012 using Strokes Gained Putting (SGP) as the measure of relative performance. Not surprising Luke and Tiger are in the top five but so are Aaron Baddeley and Greg Chalmers. Some surprise in the names not in the top 20. Broadie has moved on to trying to convince the Tour on using a similar statistical method on evaluating tee shots, approach shots (over 100 yards), and short game shots. It measures how much a person gains on a shot he has played by measuring the decrease he has accomplished during this shot in the average number of strokes to hole out minus one to account for the shot played. Simply stated a shot that is better than Tour average will have positive strokes gained and a shot worse than average has negative strokes gained. Using this method the strokes gained can be used to compare driving, approach shots, short game shots, and putting because the proficiency of all the shots are measured by a common unit of strokes gained. After applying this to the Shotlink data Broadie concludes that for the top 40 golfers from 2004 to 2012, putting only contributes 15% to their scoring advantage over the field while driving contributes 28% to their scoring advantage. He asserts that an extra 20 yards of driving distance, without regard to accuracy, is worth about .75 strokes gained per round. This extra distance gives them a shorter approach shot, with a lower average shots left to hole out, and that translates into strokes gained. So it is more important to drive it long on the Tour than hit fairways in terms of gaining strokes on the competition. When it comes to hitting approach shots it is all about proximity to the flag to improve one’s strokes gained. This has been Tiger’s secret in dominating the game the last decade and a half. The closer Tiger’s shot from 175 yards out gets to the flag versus the average Tour player the more strokes gained he has on the field. This chart shows Strokes Gained Approach (SGA) and you can see that Tiger’s SGA of 1.28 is .73 better than the average top 40 player. When Broadie breaks it down further you can see that on meat and potato approach shots from 100 to 150 yards and 150 to 200 yards Tiger is hitting it considerably closer to the hole than his peers and that is where he gains his shots on the field. The only problem with all of this is that it relies on the inundated accurate data collection of every shot a pro plays in a tournament round. No such data collection vehicle exists for the average player to use or even for researchers to use to compile strokes gained benchmarks for the common golfer. This is a huge case of having the cart before the horse when it comes to helping you and me. This review just scratches the surface of what Broadie reveals in this readable and informative treatise on this Shots Gained Method for analyzing golf stats. He dispels many of the myths and certitudes we have held dear for years about golf performance. You can pitch “Drive for show and putt for dough” right over the embankment along with a bunch of others. Broadie devotes an entire chapter to the relative difficulty of uphill versus downhill putts, importance of break on putts, and what distances actually separate good putters from average putters. He even includes practice drills that can help you understand the strengths and weaknesses of your game around the greens and work on the things that will make a difference in gaining strokes on your buds. He presents the book in a very readable format with lots of substantiating charts and graphs to help you comprehend what he has concluded. Like all good college text books he has reiterative summaries at the end of each chapter that make prepping for the exams much easier. This is not a fast read but it is a worthwhile intellectual indulgence for the inebriated golf fan. The shelf in your golf library is yearning for this one. 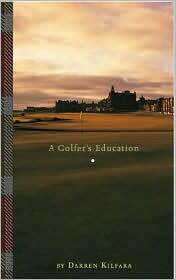 After reading the outer jacket of this book and realizing that Darren Kilfara, a junior at Harvard, had succeeded in staging the ultimate golfer’s year abroad at the University of St. Andrews, all I could do was administer myself a dope-slap and mutter to myself, why didn’t I think of that? Of course at 54 years of age that was water under the dam. The only thing left to do was experience it vicariously by reading his travelogue memoir of youthful golf discovery. What unfolds is an articulate and perceptive tale of his discovery of the charm of Scotland, golf in Scotland, and links golf in particular. Along the way he realizes there are American golf biases, like religious commitment to the scorecard and pencil, that he needs to abandon, as well as unexpected subjects that need intellectual attention, like course architecture, if he is going to come away from this immersion process with a fuller understanding of the game of golf. The book chronicles golf courses you are familiar with and one’s that you should become familiar with. His student life sketches a refreshing ground level view of life in Scotland. Through his experiences he jettisons his engrained perceptions of what golf is about and embraces the mysterious rapture of links golf it’s unique challenges. He comes to learn why those who play links golf think it builds character and enforces humility teaching us to cope with the challenges of our lives with a more realistic perspective. This book is readable and engaging-you will enjoy it for it’s insight, a strong dose of Scottish golf history, and some college self-deprecating moments you can probably relate to. For those traveling to Scotland to play golf it is a great primer, for those who have been there already it has it’s scrapbook moments.